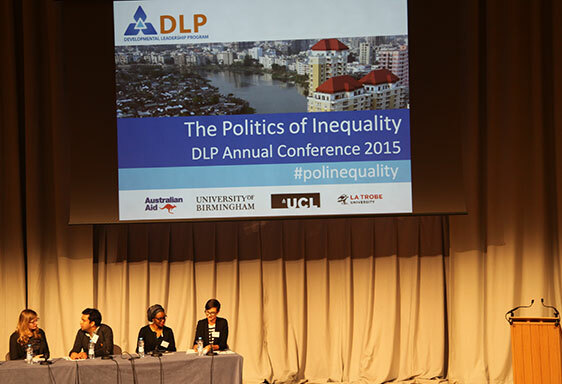 On Thursday 12 February, the Development Leadership Programme (DLP) held its 2015 Annual Conference on the theme of the politics of inequality, at the University of Birmingham. I presented parts of my doctoral research as a panelist in the session on “Inequality and Political Settlements”. With a resurgence in academic, policy and media interest in inequalities and the implications for economic prosperity and political stability of societies, the conference explored these questions: How does politics create or maintain inequalities, and which inequalities, and why? Who are the actors, what are the social structures involved? How do power, norms and ideas sustain inequalities? What is the role of leadership in perpetuating or alleviating inequalities? Presentations ranged from keynote by Professor Frances Stewart from the Oxford Department of International Development (ODID) on horizontal inequalities, to Oxfam’s Duncan Green’s recommendation for “more history” and “less math” in understanding development. There were country-specific discussions on Brazil, Rwanda, Honduras and Nigeria among others. The full conference programme and slides are available on the DLP website. The conference helped to crystallise that tackling inequality is not simply about “getting policies right” from a technical perspective, but about identifying policies that are politically viable given a particular context, and seeking to align interests and incentives in more progressive directions. A mixture of different institutional, agency, structural, and economic factors have been essential in facilitating more equitable and inclusive development across time and place. Here are my main takeaways from the day. The historical narrative we currently use to discuss what to do about inequality is limited and Northern – the New Deal in the US and the origins of the UK welfare state are far too prominent, perhaps with recent improvements in Brazil lobbed in. But a quick scan of the numbers shows that there are many more episodes of redistribution to look at (see table for some other candidates). But as well as looking at the policies involved, we want to go one step further. What were the politics that meant that these countries, at these moments, started to tackle inequality? And what were the politics that led to the end of those efforts? It would be flat wrong to claim that inequality has been kept off the agenda. We may have reservations or grumbles about how seriously inequality is taken: the relative prioritisation of growth, poverty and inequality; which type of inequality we should be most concerned with (wealth, income, gender, rights, access); how much inequality is ‘okay’; or the role of private enterprise in closing or increasing gaps, to list just a few. Even so, fromPiketty to the Palma, from the proposed SDG Goal 10 to Oxfam’s 1 percent, the debate is vigorous. But – and this is the theme of the conference – I do think most discussions have either been technical and economic, or focused on policies and on outcomes. They have not been genuinely about politics – in the sense ofpolitics as a process, the play of power, and deliberation over desired but contested visions of the good society. The interesting thing about inequality – as opposed to the more far-fetched fantasies of, say, inclusive growth or sustainable development, where all good things come together in a harmonious win-win – is that it forces us to make much harder distributional decisions. Tackling inequality is not just growing the pie for everyone; it’s about reallocating the slices. And this requires, dare I say, agency. It requires conscious deliberation by people – individually and collectively – to make sense of the social and political context they inhabit. They then have to adopt, adapt or challenge existing social norms and power relations in a strategic attempt to realise these intentions. Those intentions may or may not be developmental. But that’s politics. And there are losers as well as winners. Most measurement discussions tend to be technical ones, yet how we measure inequality, and the inequality of what, are of course deeply political issues. Happily, Alex Cobham will be addressing precisely this issue with his paper ‘Uncounted: Post-2015 and the politics of measurement’. And in a similar way, the anti-politics machine haunts discussion of policies too. In addition to the technical concerns about impact and effectiveness, different policies clearly raise normative questions about the relative distribution of benefits and losses. Professor Stewart’s lecture will address precisely this. Generally, it was good to be back in my former university, the University of Birmingham. It was even more exciting to be part of this network laying the groundwork for an issue whose importance, the global development community is now seriously engaging with, understanding the politics and the power structures underlining development policies.